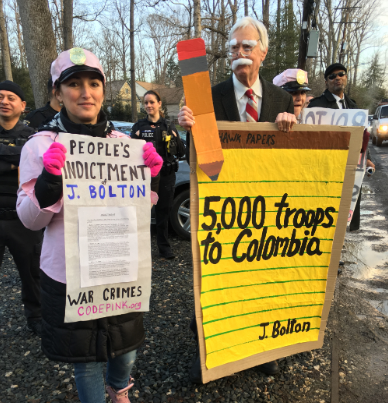 If only justice could be served for Crimes Against Humanity and War Crimes with indictments for Bolton, Pompeo, Trump and dubya and Obama, and most of congress and the current administration, as starters. They all deserve life in prison. Death is too good for all of them. Yawn. 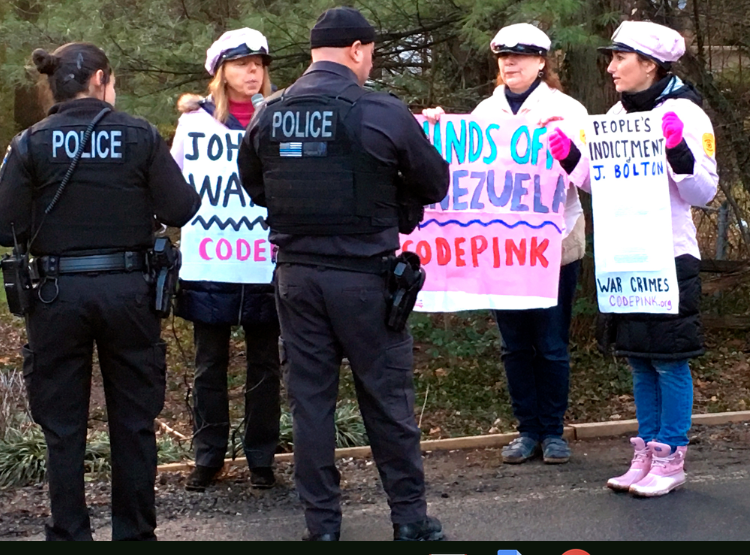 Yet again, Medea Benjamin and the liberal cattle of Code Pink substitute class struggle with political theater. Medea and her gal pals have been staging political stunts like this for DECADES. At what point do we stop encouraging her and break the news to her that IT’S NOT WORKING? I appreciate the activities of code pink much better than your yawning reply. Hear hear, a one way ticket to The Hague for all the Warmongering Neocons, in the end this will require entire passenger planes. And you have done what? I thought it was great when she interrupted that OAS meeting; might have made a difference. But this action, what was the point? So what if they had succeeded in confronting Bolton? You can’t influence a sociopath, and there is absolutely no doubt in his case. What nonsense. You do not understand how movements work. CODE PINK has done great work on lots of issues. Political theater is importat. It is a way to communicate our message, just like interrputing proceedings in Congress is important. It is not enough by itself, but it is an important ingredience. And, Medea and CODE PINK do a lot more. Medea has written seven books on key foreign policy issues. She has helped organized mass mobilizatons against war as well as encampments outside of Congress against war. 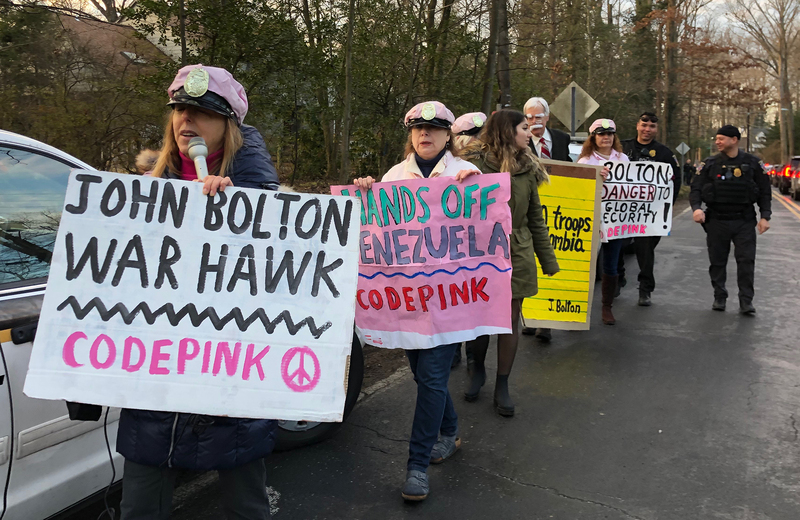 I wish we had more Medea Benjamin’s and CODE PINK’s. We need their energy and aggressiveness. I was wondering that about Lonnie Lopez as well. I’ve worked on these issues for a long time and as far as I know this is the fist I have heard of him. What was the point, exposure and media coverage. By directly confronting their opponents they’re sure to receive a direct response by which to expose them, compared to us getting sitting behind our computer screens. We’ve become better informed that is a definite plus, however, I’ve often suggested that the next step is to take the debate directly to them by for example the dreaded Tweeter world with limited amount of characters, all the big names already have accounts, the logical next step is to take advantage of that and take the debate to them, chances are they’ll simply ignore us but at least Its worth a shot. Theater is a method that allows those with an anthropological imagination for improvement to share their thoughts. Because we live unrepresented and muzzled in a procedural fake democracy these kinds of expressions are heightened in importance. Code Pink originates with nurses: They are compelled to respond to suffering.